Two is better than one—and this is especially so regarding our one-of-a-kind “Better Together” Gift Set Sale. With this special deal, you can buy a gift set comprised of 2 books, one brand new release and another, older title, from the same author, at an incredibly discounted price: the first book is 20% off the retail price, and the second one is 50% off! Each gift set is shrink-wrapped and handsomely packaged, making it the ideal Chanukah present to give to those book-lovers in your life. Whether you choose to buy The Gourmet Gift Set (The Dairy Gourmet and The At Home Gourmet), the Junior Chaverim gift set (Junior Chaverim vol. 1 and 2), The Funny Things They Say gift set (vol. 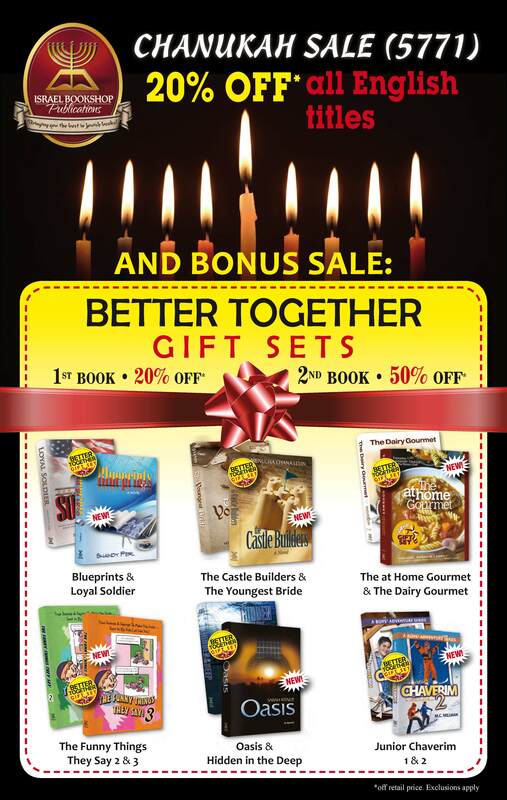 2 and 3), author Shaindy Perl’s gift set (Blueprints and Loyal Soldier), or author Menucha Chana Levin’s gift set (The Castle Builders and The Youngest Bride)—or them all!—you’ll be delighted with your metziah: top-notch reading at top-notch discounts. It’s action! It’s adventure! It’s chessed at its best! It’s…Junior Chaverim Vol. 2! When Junior Chaverim Vol. 1 was released last year, kids all over the world—especially pre-teenaged ones—immediately became hooked to the fun and spirited Junior Chaverim members in the book. Who could resist the antics and adventures of forgetful Yochanan, mechanical whiz Pinchas, and all their fellow Junior Chaverim friends, as they set out trying to do chessed with others? The good news is that Junior Chaverim Vol. 2 has just been released. And the even better news is that it is available at a fantastic deal when you buy it as a gift set together with Vol. 1! That’s right. Our “Better Together” sale allows you to buy both of these great books, shrink-wrapped together into a handsome gift set, at an incredible discount of 20% off the first book and 50% (!) off the second! Now you can buy your kids a Chanukah present you know they will love, in an affordable way! And…psst! A little secret… Junior Chaverim Vol. 2 contains the info about a special offer for kids to form their own Junior Chaverim clubs…and get a chance to have their story featured in the next Junior Chaverim book! Click here to purchase Jr. Chaverim vol. 2 online. 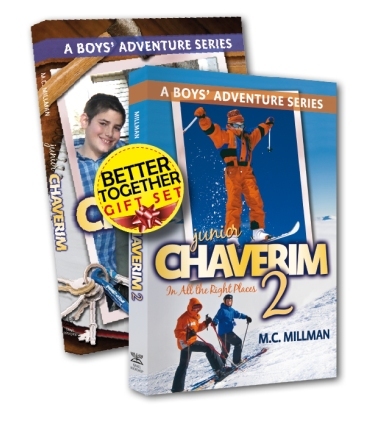 Click here to purchase the Jr. Chaverim Better Together Set. Blueprints – IN STORES NOW! If you’re a serious reader, you know her name. Shaindy Perl—popular author/editor of bestselling books Tell the World, Loyal Soldier, My Life on Wheels, and Struggle to the Summit. Well, she’s back again, folks, and this time you’re in for a really big treat, as she prepares to release her very first novel, Blueprints! This is one novel you just have to buy. Beautifully written, with characters so complex and so real you almost feel you know them, and an emotionally charged, mesmerizing plot—what more could you ask for in a novel? Besides that it should be free, of course. Well, we can’t exactly do that, but what we can do for you is give you an amazing buy on this brand new book, when you get it as a gift set together with Loyal Soldier, Shaindy Perl’s award-winning biography of a Jewish soldier who fought in the Vietnam War. The two books together make a great Chanukah gift for someone who, like you, loves to read, and the “Better Together” deal, where the first book is 20% off and the second one is 50% off (yes, you read that correctly), will ensure that you don’t feel the strain on your pocketbook, either! So off you go, fans of Shaindy Perl, and take advantage of THE sale of the season, with the Better Together Gift Set of these two fantastic books! Click here to purchase Blueprints online! Click here to purchase the “Better Together” Gift Set! Which Jewish woman worth her weight in homemade donuts and latkes can resist a new addition to her cookbook collection? And when that cookbook’s author is none other than Sarah Lasry, well-known cooking aficionado and food editor of the Binah magazine, well, you may as well throw in two of them! 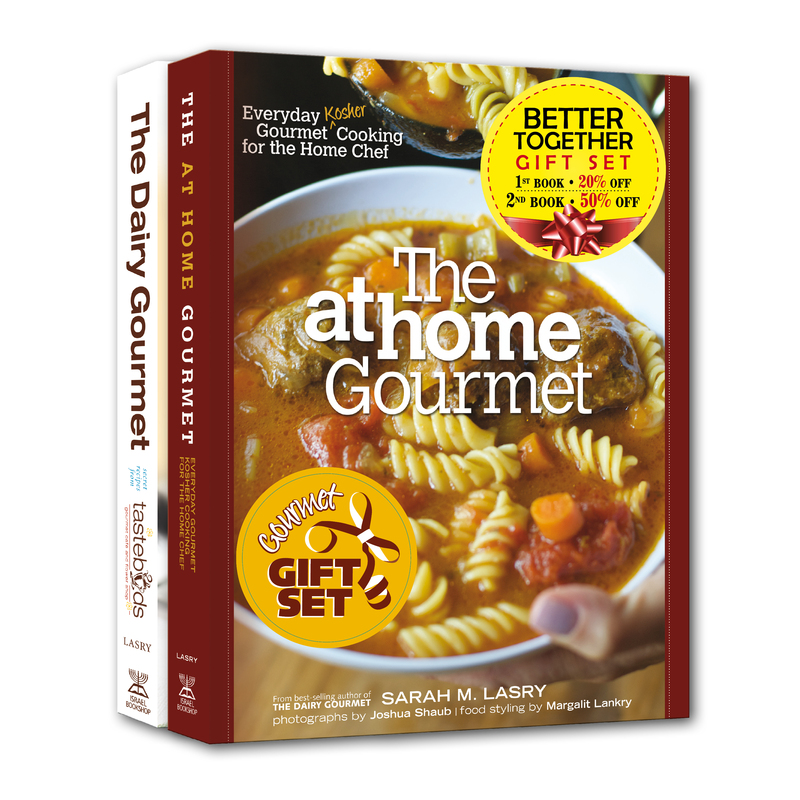 That’s what our Gourmet Gift Set is about: providing those lucky enough to receive it as a Chanukah gift, with two smashing cookbooks—The Dairy Gourmet and The At Home Gourmet. Both cookbooks are easy-to-follow and breathtakingly beautiful, with a full-color photo to match each delicious recipe. And did we mention that when you buy the 2 cookbooks as a set, your savings increase dramatically, too? The first cookbook is 20% off, and the second one is 50% off! Take advantage of this one-of-a-kind sale, and buy our Gourmet Gift Set for that special someone in your life—or, better yet, buy one for her, and then sneak one for yourself, too! Your family and guests will taste one bite of your food, and thank you for doing it! You are currently browsing the archives for the Special Discounts category.